Garlic extract is potent natural remedy for lowering blood pressure, and the use of garlic for high blood pressure (also called hypertension) has been around for millennia. Hypertension affects 70 million Americans, including about 65% of the population that is 65 years old and greater. The most common high-blood pressure drugs include beta-blockers, angiotensin converting enzyme (ACE) inhibitors, diuretics, and blood thinners, but they come with a variety of side effects, so it’s no wonder that many people turn to natural remedies for hypertension. Garlic is an effective natural treatment to lower blood pressure, and there is research to back that up. For example, in a double-blind, randomized, placebo-controlled study published in the journal Integrated Blood Pressure Control in January 2016, researchers from the National Institute in Melbourne found that an aged garlic extract was as effective as the standard blood pressure medication for hypertensive patients. In the study, 88 uncontrolled hypertensive patients received either an aged garlic extract or a placebo. Besides blood pressure, the aged garlic extract was also shown to benefit total cholesterol and low-density lipoprotein (LDL, or “bad”) cholesterol. The authors noted that aged garlic extract also has the potential to improve inflammation, arterial stiffness, and other cardiovascular markers in patients with high blood pressure. Previous studies also suggest that aged garlic extract is more effective than a placebo for lowering systolic blood pressure in those with uncontrolled hypertension. The process behind how garlic works to lower blood pressure is fairly simple. Garlic contains sulfides, specifically, an organosulfur compound called allicin—the antihypertensive abilities are largely due to this main active ingredient. Allicin is found in aged garlic extract, but it’s also formed when fresh garlic is crushed or chopped—but that’s the only way you can get it out of fresh garlic. Garlic also contains an organic compound called S-Allyl cysteine (SAC), which may have cholesterol-lowering effects. Garlic-derived polysulfides are known to enhance endothelial nitric oxide (an enzyme that helps protect the cardiovascular system) and stimulate the production of hydrogen sulfide, a vascular gasotransmitter (a gaseous molecule that sends chemical signals which trigger changes in the body). Basically, this reduces blood pressure and induces vasodilation, which allows the blood vessels or the smooth muscle cells to relax. It’s thought that sulfur deficiency may also play a part in the development of hypertension. Aged garlic extract is also not known to interact with blood pressure-lowering or blood-thinning drugs. Allicin is thought to lower blood pressure by relaxing blood vessels, reducing damage and pressure. The compound also interferes with smoothly contracting muscles and enzyme effects that increase blood pressure, and, on top of its antihypertensive ability, is responsible for the potent antibacterial, antioxidant, anti-blood coagulation, lipid-lowering, and anti-cancer activity in garlic. There is a lot of clinical research on the benefits of allicin. Besides treating high blood pressure, allicin has been found to lower total cholesterol, LDL cholesterol, and triglycerides, while increasing high-density lipoprotein cholesterol. As a result, allicin may improve the circulatory system overall, which may reduce the risk of stroke and heart attack. Allicin may also help prevent of cancer, the common cold, atherosclerosis, and diabetic heart disease. The antiviral ability of allicin allows it to fight bacteria such as drug-resistant staph infections. Some research has noted in garlic supplementation studies that certain garlic brands release less than 15% of their allicin potential. This low release is due to impaired alliinase (an enzyme in garlic that eventually becomes allicin) activity caused by slow tablet disintegration. If, however, tablets disintegrated quickly, then there was a high alliinase activity and subsequently a greater release of allicin. Powdered allicin extract is considered the best way to benefit from a standard and stable amount of allicin that is bioavailable for the body. When buying allicin or aged garlic extract products, a standardized amount should be defined in milligrams (mg) or micrograms (mcg). If allicin products are not available, choose enteric-coated garlic products that contain some amount of allicin. Kyolic’s aged garlic extract will contain SAC, which contains some of allicin’s benefits in a reduced potency. Remember, the link between raw garlic and blood pressure reduction isn’t as strong as it is with aged garlic extract, so be sure to find the extract for maximum benefit. How Much Allicin/Garlic Do I Need? Here’s how to use garlic for hypertension. The general recommendation of aged garlic extract suggests that a good dosage to lower blood pressure is 600 mg twice each day, so 1,200 mg daily. In a study published in the Pakistan Journal of Pharmaceutical Sciences in 2013, researchers examined hypertensive individuals with different daily garlic dosages, ranging between 300 mg to 1,500 mg. There were also placebo and blood-pressure medication groups used for the purpose of the study. The research team found that every garlic dosage examined lowered blood pressure as much as the blood pressure medicine had. However, there was greater blood pressure reduction with higher dosages and longer treatment time. Other garlic and blood pressure studies include a daily dose of 600 mg to 900 mg of garlic. 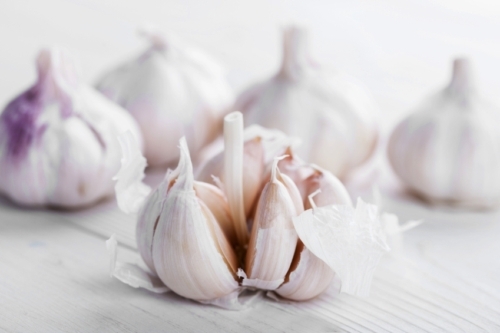 Besides garlic, there are also other natural remedies that lower blood pressure. The following are a few other remedies for hypertension to keep in mind. Coenzyme Q10 (CoQ10): Coenzyme Q10 (CoQ10) is also called ubiquinone. CoQ10 deficiencies have been reported in 39% of high blood pressure patients. A meta-analysis of 12 clinical trials from 2007 found that CoQ10 reduced up to 17 mm Hg of systolic pressure and up to 10 mm Hg of diastolic pressure in hypertensive patients. It’s recommended to take 100 mg of CoQ10 two to three times a day with meals that contain some kind of fat. Vitamin C: Clinical and population-based studies have found that a higher amount of vitamin C has a greater effect lowering blood pressure. Vitamin C supplementation is thought to reduce blood pressure up to 4.5 mm Hg in systolic pressure and 2.5 mm Hg with diastolic blood pressure. The antihypertensive effect of vitamin C is thought to be due to the excretion of lead. Chronic lead exposure is linked with hypertension and increased death from heart disease. Calcium and magnesium: Both calcium and magnesium have been found to lower high blood pressure in studies. A meta-analysis of 14 clinical trials found that magnesium reduced systolic pressure by 4.3 mm Hg and diastolic pressure by 2.3 mm Hg. Studies have also found that calcium dropped systolic pressure by 13.6 mm Hg and diastolic pressure by 5 mm Hg. Both minerals should be taken together to avoid potential heart complications from taking calcium by itself. Omega-3 fatty acids: Many standard American diets have low levels of omega-3 fatty acids, which may explain the high hypertension rate in the U.S. Fish oil is considered an excellent source of omega-3. Increasing the intake of omega-3 or fish oil in particular can reduce blood pressure, according to over 60 double-blind studies. Fish oil will typically reduce systolic blood pressure by 2.1 mm Hg and diastolic pressure by 1.6 mm Hg at a dosage of 3,000 mg of EPA (eicosapentaenoic acid) and DHA (docosahexaenoic acid) per day. Salmon, rainbow trout, and ground flaxseed are food sources of omega-3 fatty acids. Other natural remedies for high blood pressure include beet juice, black cohosh, hibiscus tea, potassium, hawthorn, passionflower, valerian, chamomile, oatstraw, dandelion leaf, reishi mushroom, taurine, folate, vitamin B6, vitamin D2, and homeopathic remedies such as nux vomica, natrum muriaticum, lachesis, glonoinum, belladonna, and argentum nitricum. Although garlic and allicin have many benefits and appears safe for most adults, there are also some minor and non-life threatening side effects and precautions to consider. For example, garlic can thin the blood and reduce blood clotting, in a manner similar to aspirin. This can be an issue particularly after or during surger, so it’s recommended to use caution when using garlic before surgery or dental work, or if you suffer from a bleeding disorder. Other side effects associated with garlic include upset stomach, heartburn, allergic reactions, halitosis, and body odor. Garlic supplementation is also thought to interfere with the effectiveness of an HIV drug called saquinavir. Reid, K., et al., “The Effect of Aged Garlic Extract on Blood Pressure and Other Cardiovascular Risk Factors in Uncontrolled Hypertensives: the AGE at Heart Trial,” Integrated Blood Pressure Control, 2016, doi: 10.2147/IBPC.S93335. Reid, K., “Aged Garlic Extract Reduces Blood Pressure in Hypertensives: a Dose-Response Trial,” European Journal of Clinical Nutrition, 2013; 67(1): 64–70, doi: 10.1038/ejcn.2012.178. Reid, K., “Aged Garlic Extract Lower Blood Pressure in Patients with Treated But Uncontrolled Hypertension: a Randomized Controlled Trial,” Maturitas, 2010; 67(2): 144–150, doi: 10.1016/j.maturitas.2010.06.001. Reid, K., “Potential of Garlic (Allium sativum) in Lowering High Blood Pressure: Mechanisms of Action and Clinical Relevance,” Integrated Blood Pressure Control, 2014; 7: 71–82, doi: 10.2147/IBPC.S51434. Lawson, L.D., et al., “Low Allicin Release from Garlic Supplements: a Major Problem Due to the Sensitivities of Alliinase Activity,” Journal of Agricultural and Food Chemistry, 2001; 49(5): 2,592–2,599. doi: 10.1021/jf001287m. Yeh, Y.Y., et al, “Cholesterol-Lowering Effect of Garlic Extracts and Organosulfur Compounds: Human and Animal Studies,” The Journal of Nutrition, 2001; http://jn.nutrition.org/content/131/3/989S.full. “High Blood Pressure Facts,” Centers for Disease Control and Prevention web site; http://www.cdc.gov/bloodpressure/facts.htm, last accessed March 3, 3016. “Garlic,” National Center for Complementary and Integrative Health web site, last updated April 2012; https://nccih.nih.gov/health/garlic/ataglance.htm, last accessed March 3, 2016. Murray, M., M.D., et al, The Encyclopedia of Natural Medicine (New York: Atria Paperback, 2012), 666–679. Balch, J., et al., Prescription for Natural Cures: A Self-Care Guide for Treating Health Problems with Natural Remedies Including Diet, Nutrition, Supplements, and Other Holistic Methods (Hoboken: John Wiley & Sons, Inc., 2004), 92–98. Rakel, D., et al., Integrative Medicine: Third Edition (Philadelphia: Elsevier Saunders, 2012), 212. Yacoub, J., “How Much Garlic Should You Eat to Lower Blood Pressure?” Livestrong web site, May 6, 2015; http://www.livestrong.com/article/434009-how-much-garlic-should-you-eat-to-lower-blood-pressure/, last accessed March 3, 2016. “The Mechanism for Garlic’s (Allium sativum) Ability to Lower Blood Pressure,” EBM Consult web site, last updated October 2015; http://www.ebmconsult.com/articles/garlic-lowers-blood-pressure-hypertension, last accessed March 3, 2016. “What Is Allicin?” Allicin Facts web site; http://www.allicinfacts.com/about-allicin/what-is-allicin/, last accessed March 3, 2016. “What Are the Benefits of Allicin?” Allicin Facts web site; http://www.allicinfacts.com/about-allicin/benefits-of-allicin/, last accessed March 3, 2016. “Garlic Supplement,” Allicin Facts web site; http://www.allicinfacts.com/garlic_supplement/, last accessed March 3, 2016.